Sam Angell appears as The Boy in Dr. Seuss’s The Cat in the Hat adapted by Katie Mitchell. After playing at Leicester Curve over Christmas, the production, directed by Suba Das, embarked on a UK Tour which will end at Rose Theatre Kingston. Based on the much-loved book by Dr. Seuss that has captivated generations of readers, The Cat in the Hat features feline frivolity aplenty. With acrobatic accomplices Thing 1 and Thing 2, riotous rhymes, infectious humour and spectacular circus. 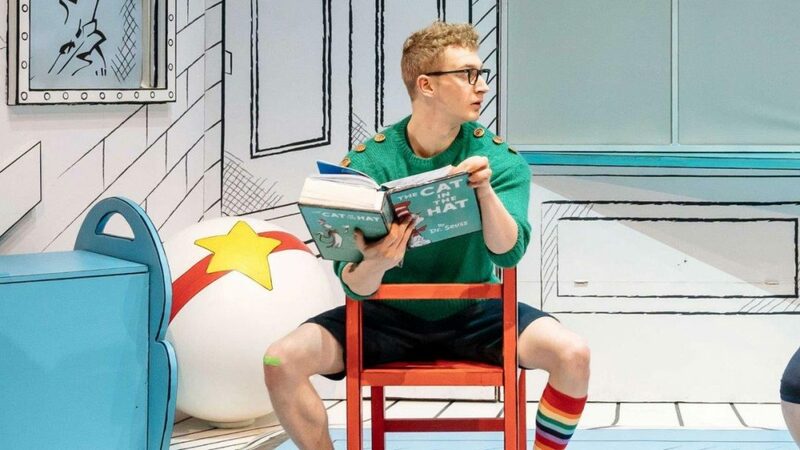 The Cat in the Hat is at Rose Theatre Kingston 10th to 21st April 2019. What can you tell us about this production of The Cat in the Hat? This production of Cat in the Hat is full of anarchy, acrobatics and fun for all ages. Lots crazy people bringing Dr Seuss’s crazy characters to life in a unique way. You play The Boy, what do you like most about the character? What I like most about playing Boy is the freedom to play everyday on stage. The Boy, being only 5 years old, is constantly discovering new things and forming immediate opinions about things – most importantly, discovering his moral compass and what he deems “good” and “bad”. How would you describe the way Katie Mitchell has adapted the classic Dr. Seuss story for the stage? Katie Mitchell’s adaptation of Cat In The Hat has been cleverly done – it sticks extremely closely to the children’s book, which is cool as the kids haven’t lost any of this beloved story in translation. What’s the most challenging thing about performing for children? The most difficult part of performing to kids is that they are brutally honest. If they aren’t fully invested what you’re doing, they’ll let you know! We’ve had some really funny things being shouted from the audience over the past few months that sometimes it’s been really difficult to keep a straight face. You’re reaching the final stop on the tour, what have you enjoyed most about touring with this production? The best part about touring this show has been being able to adapt and play on stage depending on different audiences. Audiences in different cities have reacted differently to certain parts of the show and it’s been fun to specifically play to the people we have in front of us. What would you say to anyone thinking of coming to see The Cat in the Hat? If you’re coming to see Cat In The Hat, I would say to bring a Poncho! And don’t be afraid to join in.